This Saturday (26th Feb) I went to Pasir Ris Pond for fishing trip organised by my Company for $18 per person (we were 15-20 people) from 10 AM to 3 PM. Also, dead prawns were provided to us as food for fish and Chicken Rice as food for us . I setup my rod and began fishing with prawn meat. I tried different rigs like Float, LSBF, sliding sinker etc. Some people had brought their own live prawns and one guy caught a small fish using floater rig with live prawn. Till noon no catch for me. Then a pond employee came in a motorboat and released some fishes from the nets which were near us. As soon as he left that area, at least 10 people bombarded that area with their sinkers and all hell broke loose... Maggie Goreng everywhere; I too got caught in it and lost precious time. Although this guy didn't give any fight while reeling, it jumped and jumped hard for such a long time after removing from water. He had 2 long fangs on top jaw and some 4-6 more on bottom, so I was afraid to catch it. I threaded through his gills n mouth and kept it in water. 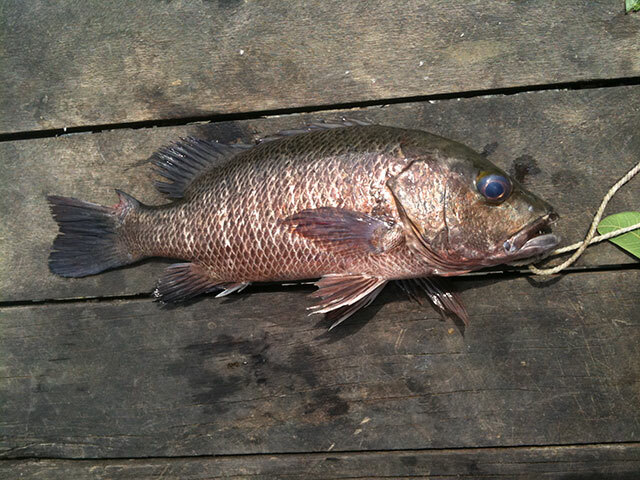 Then one guy from our group caught a 2.8 kg monster , looked like a KBL to me and it was HUGE!!! Nearing 3 PM, not another catch for me, so I disassembled my rod and began luring with my smaller rod using spoon. No catch again. So I packed up and went home. All the while the fish was jumping vigorously in the plastic bag that I took him in. Wifey said this not KBL, I confused coz I thought it was KBL. Can anyone confirm this? Heh, typical scene when it's time to release the fishes. I can't see the images still so I can't verify the fish for you. Perhaps you can upload the image to another image host or email me like the last time. It must have been an exciting day for your group, the 2.8kg fish must have send some people wow-ing. It seems Imageshack goes down at this time everyday Coz I can upload and see images in day time. Can't upload to other host since only Imageshack opens from my office computer. Anyway I sent email too. The 2.8 kg fish was indeed catch of the day (or lifetime) for us. But surprisingly it was not jumping when removed from water like my small fish. And finally I was astonished to see so many people willing to pay for fishing, even at the Pro pond. I never thought that it will be so crowded there. 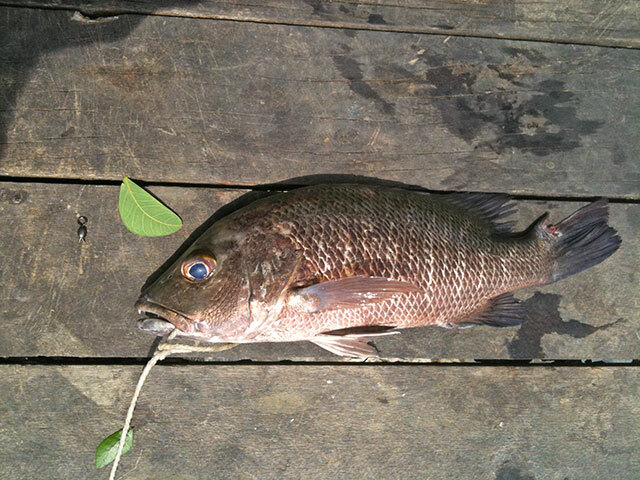 That's definitely a Mangrove Jack, nice catch there. We're all paying for fishing in some way, be it boat fishing or even shore fishing.